Posted on August 29, 2014 by Mark Pajor. The grounds where the Electrical and Computer Engineering Building now stands have a long history with Illinois. It’s where the first Illinois students arrived to take classes. Red Grange played his first season at Illinois, helping the football team to an undefeated season. Freshman students burned their signifying caps – which they were required to wear at all times – at the end of each year. The Illini baseball team won 24 Big Ten Conference titles. These moments of Illinois history took place on the grounds where the ECE Building now stands. The site of the ECE Building has been part of the Illinois campus since the university’s origins. When the university opened as the Illinois Industrial University in 1867, the first university building was located in the north-center of what is now the Beckman quad, between where the Beckman Institute, the Coordinated Science Laboratory, and the ECE Building stand. This five-story building, variously called the University Building, the Old Main University Building, and “The Elephant,” held classrooms and dormitories for the university’s first students. When a series of destructive storms damaged the building in 1880, it was vacated and torn down, opening up space for Illinois Field. 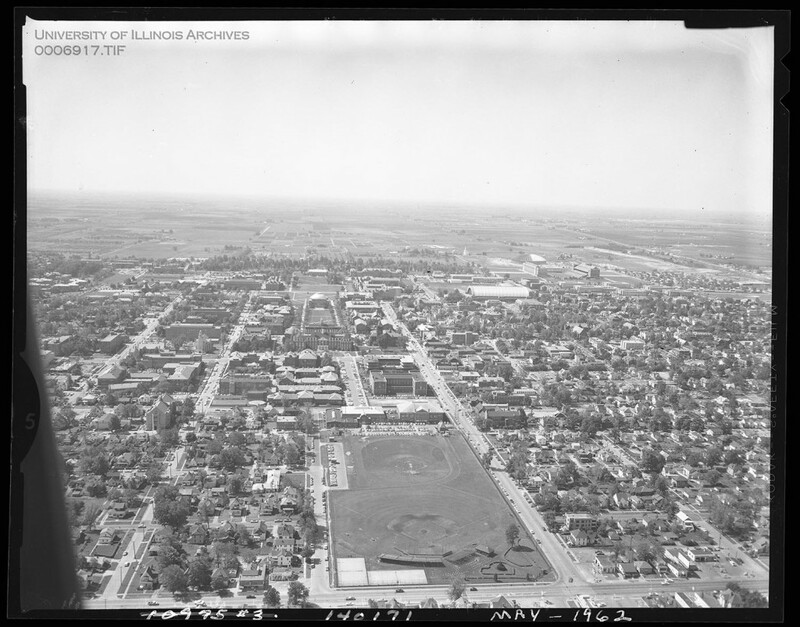 An aerial shot looking south, with Illinois Field in the foreground, taken 1962. Photo courtesy of the University of Illinois Archives. Click to enlarge. The Illini baseball team played on Illinois field for about a century, starting in the 1880s and ending in the 1980s. The team picked up 24 Big Ten Conference titles in that time, and featured famous players like Lou Boudreau, who went on to become a Major League Baseball player and manager who was elected to the Baseball Hall of Fame. The Illini football team also played on Illinois Field starting in 1891, until the opening of Memorial Stadium in 1923. The team performed exceptionally, earning several undefeated seasons, Big Ten Conference titles, and national championship titles. In 1910, the Illini were not only undefeated, but also unscored upon for the entire season. That year also marked the first Illinois Homecoming game, which is the second recorded instance in the nation of the now-ubiquitous tradition of football homecoming games. In the football team’s final year on Illinois Field, the Illini – including first-year player Red Grange – achieved phenomenal success. The team went undefeated that season, winning the Big Ten Conference title and the national championship title. Red Grange went on to become one of the most celebrated of collegiate-level football players and a professional player for the Chicago Bears. Other famous contributors to the Illini throughout the Illinois Field period include Hall-of-Famer George Halas and Robert Zuppke, coach from 1913 to 1941 and College Football Hall-of-Famer. 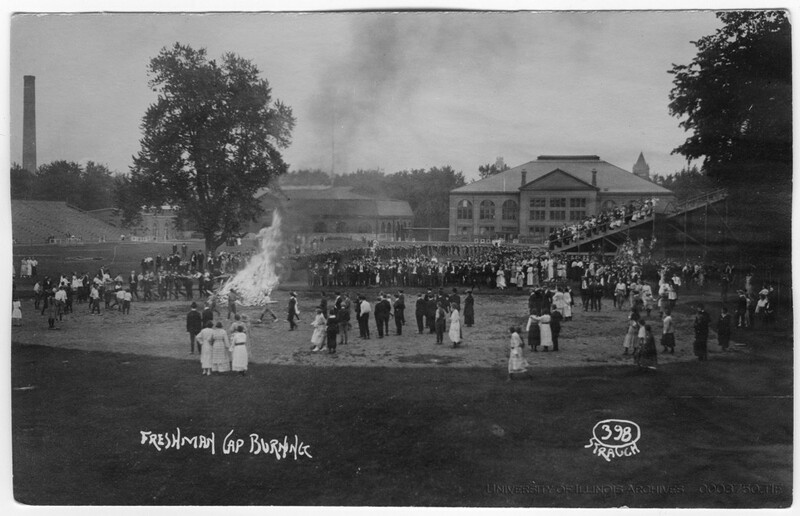 An image of Illinois Field during the freshman cap burning ceremony, taken from a postcard circa 1913. Courtesy of the University of Illinois Archives. Click to enlarge. The centrality of Illinois Field for social life at Illinois went beyond the Illini teams’ success. Students used the field for events and traditions. One of these was the freshman cap burning. In the early 20th century at Big Ten schools, including Illinois, upperclassmen pressured male freshman students to wear caps that would identify them as freshmen. At Illinois, they were green caps called “spots” that freshmen were expected to purchase and wear constantly during the entire academic year. At the end of the year, the freshman students would hold a ceremony, burning their caps to mark their elevation to sophomore status. Often, they held this ceremony at Illinois Field, as shown in the above postcard image. When you visit the ECE Building this fall, whether you are a student arriving for classes or an alumnus returning for our building dedication Oct. 10 or the Alumni Board Homecoming Open House on Oct. 25, we invite you to think on the importance this place has had to Illinois over the decades. The place where ECE ILLINOIS’ faculty will guide some of the nation’s brightest students has an abundant history. And you will be part of a new chapter in this place’s history – a chapter authored by ECE ILLINOIS students, faculty, and alumni.